Dice is a Bitcoin casino game. It is loosely based on Sic Bo, where the player guesses if the dice roll will be higher or lower than average. There is basically no skill involved in it, but many variables and lots of flexibility for the player. Each roll of the 'dice' produces a random number between 0 and 100. Players choose whether the number will be greater or less than the average, which is 50 by default, but can be adjusted. 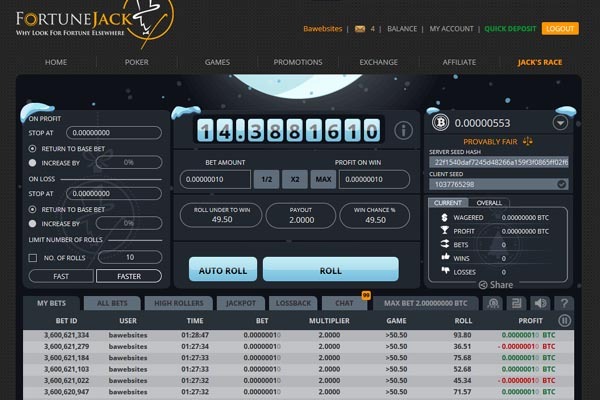 'Dice' is the most popular game at many Bitcoin casinos. Most casinos have created unique Jackpots within their games. Thanks to Bitcoin casinos, you can sign up and play! It takes only minutes to get started. Find more information on Dice here. Want to play Dice with Bitcoin? BitCasino is our top choice for you. Sign up there, or choose one of the other casinos. The main difference between Bitcoin Dice and traditional Dice is how the random result is produced. With traditional Dice, the casino produces all of the results. In most cases, a third-party human regulator will test the games periodically to determine if the casino is indeed producing their results randomly and fairly. The Provably Fair system relies on cryptography instead, and does not require this human interaction. The process starts the same, with the casino producing a random number. At the same time, you can generate your own number, or your browser will do so automatically. These two numbers are combined in an equation to produce the final result for your Dice game. You can then verify that the equation was done fairly and accurately on a third-party website.